Campi ya Kanzi and the Maasai Wilderness Conservation Trust received a tremendous donation from two extraordinarily generous guests whom decided that they would like to Pack for a Purpose! Campi ya Kanzi, located next to Kenya’s Amboseli National Park and bordering Tsavo West and Chyulu National Parks, is a luxury safari camp with a difference. The Camp is a joint venture between a private company (Luca Safari) and a Maasai group ranch. It strives to provide tangible economic benefits to the local Maasai community, to enhance their cultural welfare and pride, and to protect wildlife through demonstrating that game-viewing tourism is more lucrative than hunting or poaching. These benefits are further provided through the Education, Health, and Conservation Programs that are facilitated through the partnering Maasai Wilderness Conservation Trust. Two guests, Elizabeth and Ramsey, stayed at Campi ya Kanzi for a week. This American couple found Campi ya Kanzi and the Maasai Wilderness Conservation Trust due to a passion of understanding the elephant poaching epidemic and it’s effects on the elephant population as well as the ecosystem in Kenya. Prior to making the journey to Kenya from the United States, Elizabeth hosted a gathering in her home. 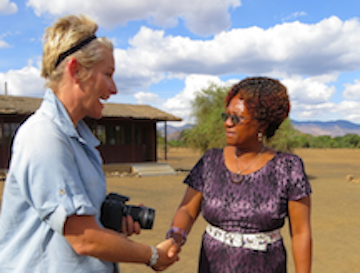 Twenty-seven women met to learn through Elizabeth about the elephant-poaching crisis in Kenya. Also mobilized at this home gathering was knowledge and information that Elizabeth had learned and gathered from conservation trusts that are key stakeholders in the elimination of elephant poaching – the Maasai Wilderness Conservation Trust being one of them. 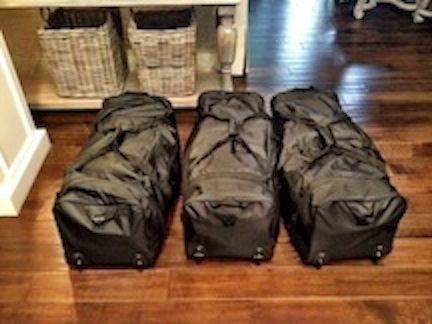 Elizabeth and Ramsey believed in Packing for a Purpose for their journey to Kenya. Provided at the gathering was a donation request list – the one that is provided on our Pack for a Purpose posting in regards to our Education program. The purpose of these donations would be to support the Education Program that is facilitated through the Maasai Wilderness Conservation Trust, and more specifically, our Kanzi Academy Program (a private boarding school that is funded and operated by the Maasai Wilderness Conservation Trust located at Campi ya Kanzi for highly talented students from all over Kuku Group Ranch). We cannot express enough gratitude to Elizabeth and Ramsey, for not only travelling across the world with three large bags of school donations, but for expressing immense support and gratitude towards our programs here in Kenya, and especially for inspiring such generosity in all of the 27 women that made donations. The positive impact that is created when our guests to Campi ya Kanzi bring along any sort of donation is immense. The magnitude of this donation was extraordinary, and the lasting effect it will have on the future leaders of this region in Kenya will be tremendous. The donated total was approximately 14,000 items (approximately 60 kilograms divided into three duffel bags). The supplies that were donated were overwhelming. 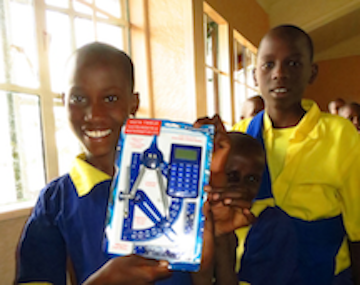 Campi ya Kanzi and the Trust believed that it would be most beneficial to our Education Program if the supplies were distributed between four different schools within the Kuku Group Ranch – in order to best distribute the benefits equitably. 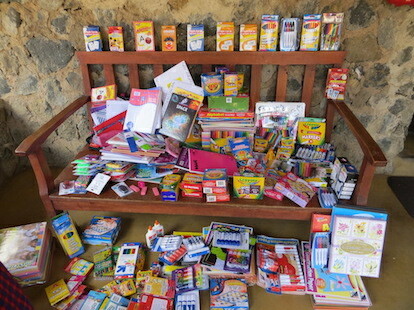 The first school to receive the donations was Iltilal Primary School. 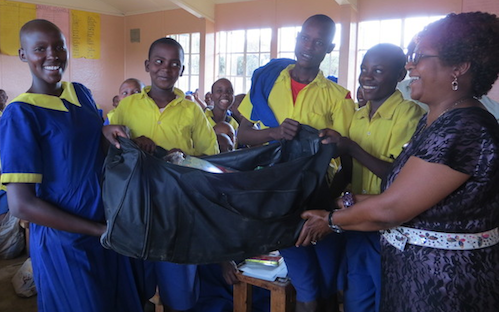 This school, with 861 school children from grades Nursey – Grade 8, hosted Elizabeth in her visit to the classrooms to present the supplies. The distribution of the remaining supplies to the 3 remaining schools will continue throughout the month of November. The generosity of our guests at Campi ya Kanzi is immensely appreciated. Asante Sana Elizabeth and Ramsey for Packing for a Purpose, your donation and support has contributed to the aim and objectives of the partnership between Campi ya Kanzi and the Maasai Wilderness Conservation Trust and the lasting impression that it will create for hundreds of school children for years to come will be legendary.